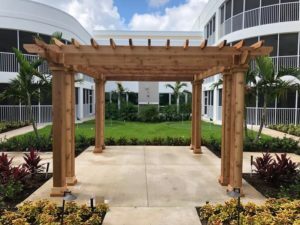 Contact Hitching Post Backyard Specialties Our extensive outdoor furniture showroom is conveniently located right off West Atlantic Avenue in beautiful Delray Beach, Florida. We are the largest and most extensive outdoor showroom with full collection of wood playsets, modern outdoor furniture, custom backyard sheds, back patio pergolas, custom backyard pavilions, gazebos and much more. We have been helping Florida residents build backyard dreams since 1979. People come from all over Florida have shopped at Hitching Post Backyard Specialties for all of the backyard needs. Our convenient location in Delray has a wide array of Playsets, Gazebos, Pergolas, Pavilions, Sheds and Garages on Display. Come visit us today! We install all of our producst throughout south Florida. Our extensive services include wooden playset and vinyl playset installation, gazebo customization, outdoor furniture and more. We service Fort Lauderdale, Miami, and Palm Beach County. Call us today for more information!